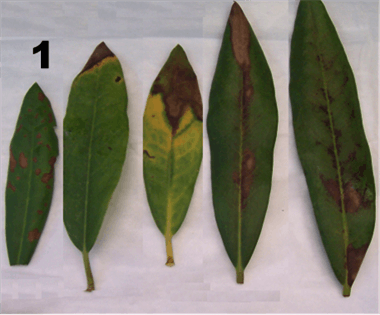 Leaf spot and blight in Rhododendron caused by P. ramorum. ANNAPOLIS, MD (January 05, 2017) – Sudden oak death, a relatively new disease, caused by the pathogen Phytophthora ramorum, was found for the first time in 1995, infecting oaks in California. The disease was known only in California and southwestern Oregon until 2002. However, the U.S. nursery industry was not significantly affected by the pathogen until 2004, when a few large West Coast nurseries inadvertently shipped over a million potentially infected plants throughout the United States, resulting in detections at 176 nurseries in 21 states, including Maryland. 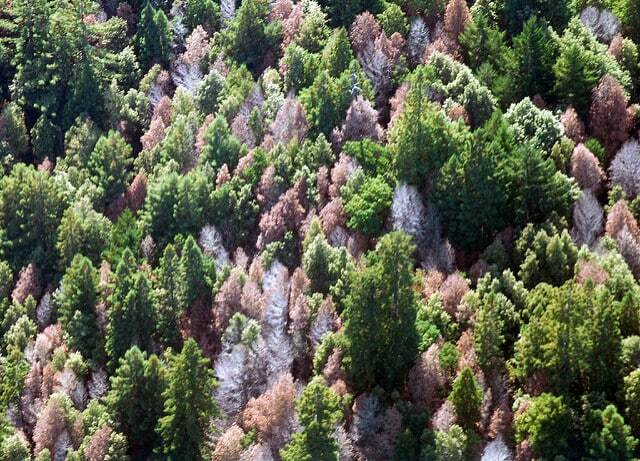 Currently, the disease is established on the West Coast (California, Oregon and Washington), where several thousand oaks of various species have been killed. But this pathogen infects many plant species besides oaks. A list of host plants can be found at the APHIS website at the URL below. Among these hosts, five different ornamental plant species: Camellia, Kalmia, Pieris, Rhododendron, and Viburnum, are considered most susceptible. This pathogen has been intercepted a number of times in several other states in landscape plants shipped from the western states. Repeated entry of the disease has been a major concern for many nurseries, landscape companies, and home owners throughout the US, including Maryland. Because this lethal plant disease has been found in Maryland, the Maryland Invasive Species Council has chosen it as the January Invader of the Month. In Maryland, the pathogen was identified in plants at a big box store in Baltimore County in 2004 and at a homeowner's site in Montgomery County in 2012, as "trace forwarded" samples. (In a trace forward, regulatory authorities follow the sales and shipment trails from the production nursery to the wholesaler or retailer to the end purchaser of a given plant.) The diseased plants were destroyed and sites were cleaned. In 2016, during a nursery survey in Howard County, P. ramorum was discovered in two mountain laurel plants — Kalmia "Olympic Wedding" and one Rhododendron"Cunningham White" plant. This was the first time the disease was identified in a Maryland nursery. Plant material came from both Maryland and Oregon but no identifiable source for these diseased plants was found. Twenty-three homeowners in Maryland purchased the same plant cultivars from this infected nursery and of those, one Rhododendron "Cunningham White" tested positive for P. ramorum. This occurrence shows the need for nurseries, landscapers, and homeowners growing P. ramorum susceptible plants to be alert for possible symptoms. Sudden oak death causes a rapid decline in oaks. Symptoms include bleeding cankers and foliage dieback, eventually leading to the death of the trees. However, in the Eastern United States, other disorders, such as oak wilt, can cause similar, confusing symptoms. Phytophthora ramorum causes symptoms of leaf spots, foliar blight and/or dieback in numerous woody ornamentals. As in oaks, these symptoms can be similar to those caused by other Phytophthoraspp., other pathogens or abiotic causes. Out of more than 60 identified species of Phytophthora, 16 have been found in Maryland nurseries. Sudden Oak Death mortality affecting stands of Tanoak, Notholithocarpus densiflorus in Marin County, CA. Photo courtesy of U.S. Forest Service, Region 5. Active P. ramorum produces mycelium, which can produce asexually by chlamydospores, sporangia and zoospores. Many infections are initiated by sporangia and zoospores. Sporangia produced from mycelial colonies germinate directly at high temperatures, but at low temperatures, zoospores are released instead. Chlamydospores (thick-walled, resistant structures that survive unfavorable conditions) may persist in soil and leaf litter up to 8-11 months. Two different mating types of mycelium reproduce sexually, producing oospores, which are resistant to adverse conditions. Zoospore release is stimulated by cold temperatures, and zoospores/sporangia tend to aggregate at the water surface. Turbulence causes zoospores to lose their tail-like flagella and form cysts. In many host plants, P. ramorum causes leaf and twig infections that are rarely fatal but which act as a reservoir for the pathogen, serving as a source of new infection. Cankers on basal stems often kill the plants but no spore production has yet been observed on canker surfaces. Root infections can remain symptomless for months, and this pathogen can persist in substrate and water runoff for up to five years. Short-distance dispersal of the pathogen takes place through water, including splash, untreated irrigation water, standing surface water, and infected soil. However, long-distance dispersal happens by moving infected plant materials. With a broad host range of woody ornamental plants, and forest trees, this fungus-like organism can spread quickly, persist longer than other pathogens in the environment, and reproduce easily in new environments. The ability to reproduce sexually or asexually, a short life cycle, ease of spread through contaminated soil, water, and windblown rain, and its ability to survive adverse climatic conditions in the form of oospores and chlamydospores, all favor this species' invasive potential. Containment is the best method to control exotic invaders. Nurseries in quarantined areas are inspected, surveyed, sampled and tested periodically for pathogens like P. ramorum. Best management practices have also been developed for nurseries. Containment measures used for Phytophthora spp. include sanitation, use of disinfectants, fungicides, fumigants, as well as treatments of water, growing media and floors. Eradication of P. ramorum from a nursery rather than containment can be done only through removal and destruction of all infected plant materials, with sanitation and follow-up surveys. Sanitation is important at all times to maintain a pathogen-free nursery operation. These practices includes testing of symptomatic stock, sterilizing potting media, as well as disinfecting tools, benches, workers' clothing and equipment. All symptomatic material or diseased plants should be disposed of in a sanitary landfill or sterilized. Water management is essential because contaminated irrigation and recycled water use can disperse Phytophthora propagules directly by delivering contaminated water, or indirectly by splashing inoculum from plant and ground surfaces to other plants. This invasive pathogen has the potential of eliminating many valuable plant species, altering both natural habitats and planted landscapes if it escapes into in the environment. We must always be vigilant and proactive, looking for suspicious symptomatic plants. APHIS List of Regulated Hosts and Plants Proven or Associated with Phytophthora ramorum. Anon. 2013. Biology of Sudden oak death. Anon. 2016. Sudden Oak Death.